I feel like the word “pizza” has become so distorted, it now pretty much means anything slightly resembling the actual thing (kind of like the word “celebrity”). 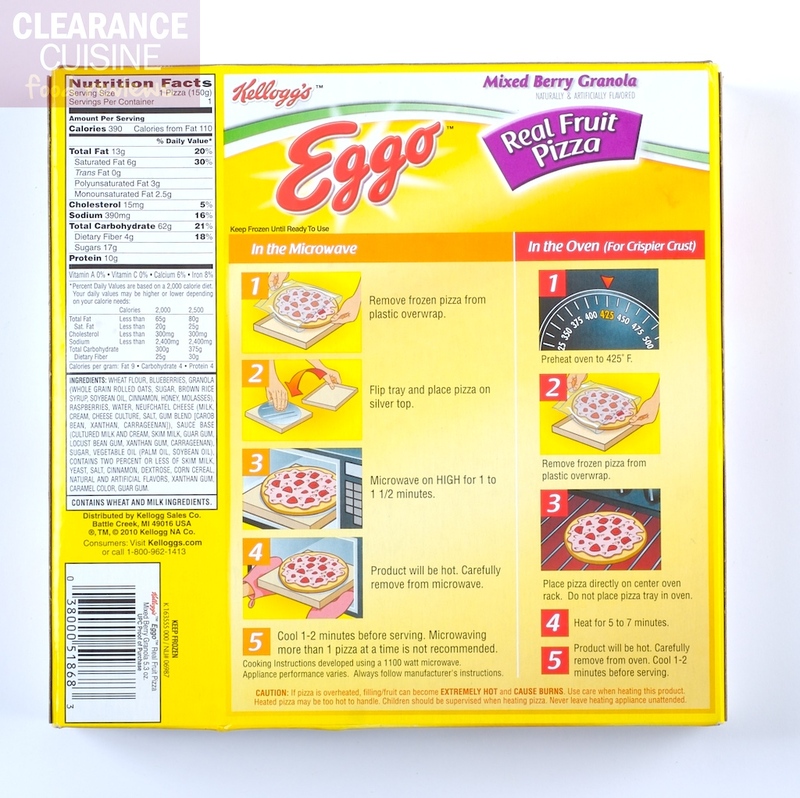 Even more, Kellogg’s has to note that this is real fruit pizza, because just the word “fruit” cannot guarantee actual fruit. For example, Strawberry Fruit Roll-ups contain the word “fruit” and have pictures of strawberries on the packaging, but actually just contain pear concentrate with corn syrup and colors (it’s hard to have flavors like “Tropical Tie-Dye” and “Screamin’ Green” without adding some food dye). But I digress. There were two flavors to choose from – strawberry and mixed berry. Since I’m quite the health nut, I went with the mixed berry since it was 10 calories less than the strawberry flavor. The entire pizza still has 390 calories. After reading several reviews that complained that the product was quite soggy after microwaving it, I opted to use the oven method to ensure a crisp Eggo crust. Also, many reviews mentioned that one minute of microwave cooking time left most of the pizza still frozen. The resulting product was indeed crisp (if not a little too brown around the edges), but just a little too dessert-like for me. 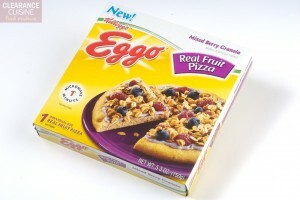 I only took a bite or two, but the breakfast pizza was less like a pizza and more like an Eggo-like crust, berry flavored cream cheese (or “yogurt”) with a pulverized fruit granola bar on top. 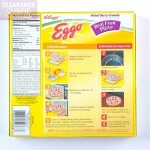 If anything, you could technically enjoy breakfast with an Eggo Real Fruit Pizza (taco-style) in one hand, a Griddle Stick in the other, stick your cell phone bluetooth in your ear, a Starbucks latte in your car’s cup holder and possibly drive at the same time. A true breakfast of champions. This entry was posted on Thursday, February 24th, 2011 at 6:00 am	and is filed under Food. You can follow any comments to this entry through the RSS 2.0 feed. Both comments and pings are currently closed. Click “Past Reviews” at top to see an alphabetical list. I always hesitate to call this a food review blog. I believe the taste, enjoyment and pleasure of pretty much all foods is quite subjective. Until someone (Webster’s dictionary or otherwise) develops a word for the antithesis of a foodie, epicure, bon vivant or gastronome, I generally place myself into a category of people who can eat, enjoy or tolerate pretty much anything (I’d say human garbage disposal, but that doesn’t look professional on a business card). My approach is simple. Find discounted food/drink and just write about it – whether a food is foreign, vegan, meant for children, etc. I could care less if a candy has high fructose corn syrup, agave nectar, Splenda or otherwise, but if it has amusing packaging or an insane marketing campaign, you bet I’m gonna write about it. This blog has one mission: finding cheap food, make the most of my 99 cents and having a fun time doing it.